At the Rock of Eternity, a trio of the "greatest transgressors mankind has ever known" were tried. One was a leanly muscular Caucasian male with reddish-blonde hair and numerous bodily scars. "I will not beg, wizards. I defy the authority you claim! Do what you wish to me! But if you do not kill me, I will rise to power again! And you will fear my name as does the world!" Or not, since the beings made this guy forget his own name, along with everyone else. Further, they stripped him of his face, turning it into a mass of flesh. "You will forever question your identity and forever search for answers you will never find." I really have to applaud DC for giving away a free comic book featuring their biggest names. Shame it was so cheesy. 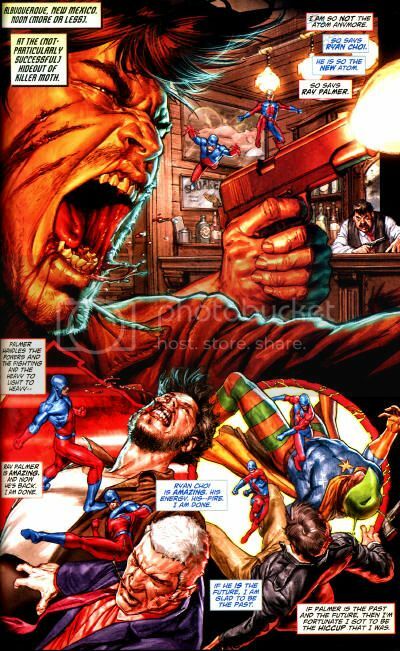 The first four pages were drawn by Ivan Reis. 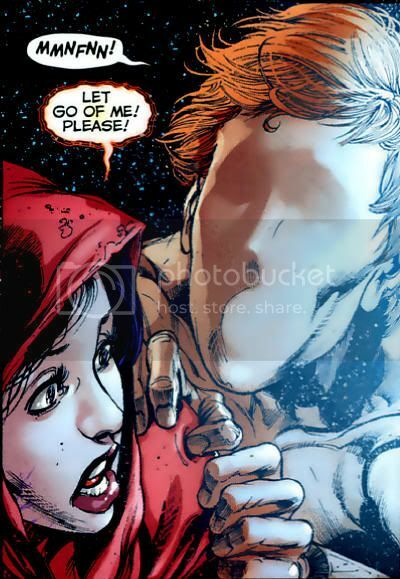 We learned that the Phantom Stranger is probably Judas, that the Question is most likely now a mystical being, and that the actual Pandora is the mysterious anti-heroine who was shoehorned into all the New 52 #1s. Together, they form the "Trinity of Sin." These are all still terrible ideas. Having 8th century B.C. Pandora being tried alongside thirtysomething A.D. Judas and Rorschach by a bunch of Crossgen sigil-bearers does not impress. Was the historian consulted named Kirk Cameron by any chance? Kenneth Rocafort drew pages 5-6, and I wish that he hadn't happened, because I didn't like looking at them. They were preoccupied with trying to convince folks that Cyborg is a worthy addition to the JLA. Not likely. Then there's this thing with five pages of Gene Ha art involving Steve Trevor and Pandora's Box, except the box is a skull. Whatever. Finally, there was a flash forward to the future drawn by Jim Lee, which was so disconnected from the main narrative that you know this is literally pages Jim Lee has already drawn for a script a year in advance because he doesn't want to blow his deadline (spoiler: he'll blow his deadline.) I've been over Jim Lee a damned long time now, and dual gatefold battle scenes that are sparsely populated by action figures amidst lazy props/backgrounds (wooo, nondescript pillars and rubble) had a lot to do with that. It foreshadows "The Trinity War," which is about how the Puerto Rican Vibe (? ), the African American Green Lantern, and the Asian (?) female (?) Atom aren't as good as their Caucasian betters, while hurling unjust accusations at the Anglo-Saxons Supreme. Oh, and Cyborg (eyes roll...) I'm not sure who is on which side, but Black Adam, Deadman, the Flash, Aquaman, Mera, Wonder Woman, Element Woman, Batman, Green Arrow and Hawkman were also present. Twelve pages of back matter reprints incomprehensible excerpts from the New 52 Wave Two titles ordered at a fraction of the levels of Wave One books. 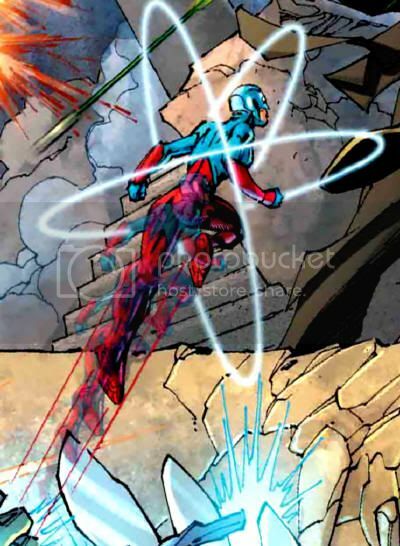 Even Captain Atom. • The conclusion of “SON OF SATAN’S RING”! • The mole inside S.H.A.D.E. is revealed. I'm reminded of the Lorena Marquez Aquagirl, which is a good thing. Hopefully Hawkgirl will maintain her JSA Latina qualities from last incarnation, since making her black would be an unnecessary alteration in the minority coin toss. It might also mean there's still a Shayera Thal out there somewhere as a separate entity. The points breaking the mask barrier remind me of the strands of hair that used to give Vixen catseyes. It's illogical, but looks cool, so keep schtum. I'm cool with the guns,as well. Color scheme will have to grow on me, and I'm pretty resistant to the design aesthetic of Earth-NU2. 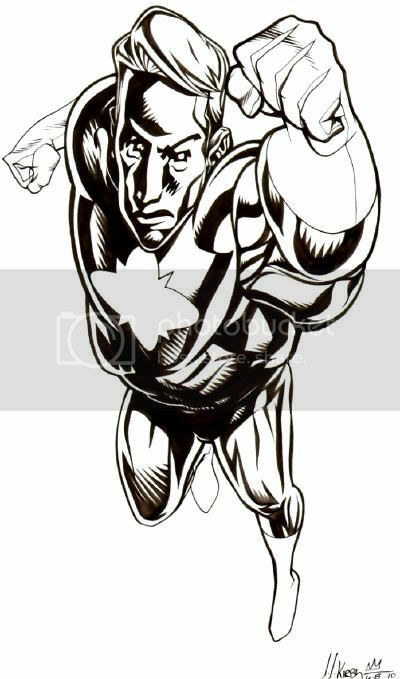 • CAPTAIN ATOM’S evolution continues as he regains his human appearance. 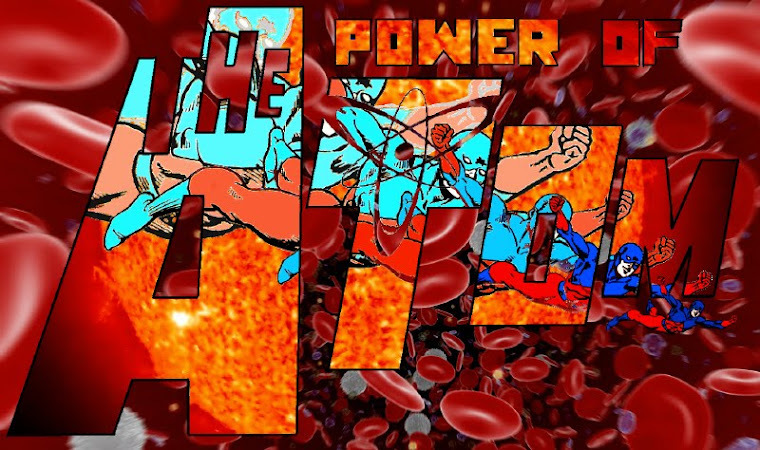 But even though he’s closer than ever to regaining his humanity, it comes at a major cost as chaos is unleashed at his laboratory headquarters. • This issue reaches from Earth to the edge of the universe and ends with a massive change in Captain Atom’s status quo in the DC Universe. The book is toast, so barring a some reprieve, this will likely be the last Atomic acCount for the foreseeable future. Any last vouchers to encourage buying a trade paperback collection? • HAWKMAN vs. ST. BASTION – with PIKE, an incredible assassin with key info about Hawkman’s past, caught in the middle! Green Arrow and Green Lantern Hal Jordon were discussing the latter’s three way with Huntress and Lady Blackhawk while moving their proactive crusade against crime to Gotham City. Hal also confessed to never liking Batman, as if anyone does. A private investigator once employed by the Dark Knight named Jason Bard pointed them in the direction of a hideout to raid. Meanwhile, Starman and Congorilla had separately made their way to a Blackhawk Island, which villains had taken as their own. The heroes mistook one another for bad guys, but in the mighty Marvel tradition, worked their way toward camaraderie through blood sport. Realizing that they were both crying… for… JUSTICE, they climbed into an old airplane and continued pursuing it together. Crooks had trashed the Flash museum while stealing the Cosmic Treadmill, so the Golden Age model speedstar found himself greeting the Atom. Jay asked Ray to please not refer to him as “Mr. 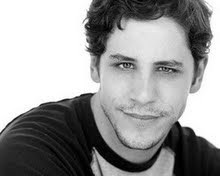 Garrick,” and Palmer was feeling the years his own self. “I see it every time I look in the mirror. The last couple of years have hit me hard… Hey, I’m alive. Makes me luckier than Ralph and Sue.” Jay’s child helpers had grown up to guard the museum, and were murdered because of it. The Tiny Titan had three more reasons to track down Prometheus, then. The Freddy Freeman incarnation of Captain Marvel showed up, a friend to the Atom dating back to when Ray was de-aged and led the Teen Titans. Even with all the madness Ray had lived through, that period was the most dreamlike to Palmer. Freddy explained that he was on the trail of Zeta Beam technology stolen from S.T.A.R. Labs in Fawcett City. 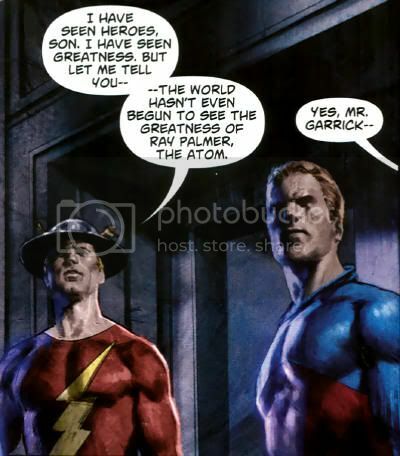 Captain Marvel and the Atom decided to pair up to continue the investigation following Palmer’s lead in Gotham City, while the Flash intended to keep in touch as the situation developed. Following Green Lantern and Green Arrow’s successful raid, Captain Marvel and the Atom joined the pair… for justice! Hal was supposedly almost killed by Javelin, but Supergirl turned up to save the day. The second chapter of Cry For Justice, “The Gathering” was by James Robinson and Mauro Cascioli. Still a good looking book and still a bit plodding, but reads well when taken as a chapter in trade paperback. I recognize exception was taken at the more prurient aspects, but I could actually see Helena and Zinda of all heroines taking a swing down the Hal pole. I don’t think it reflects especially badly on anyone, and the comments were just vague enough to retain the option of personal interpretation. I also appreciate Robinson remembering little bits of continuity, especially when it comes to characters as oft-neglected as the Atom. 22,300 miles above Earth in the JLA satellite, Green Lantern Hal Jordan demanded a new course for the team. With Batman and Martian Manhunter recently killed, Jordan wanted to start attacking evil, rather than responding to it. This was a stance no other current Leaguer besides his old buddy Green Arrow was willing to take, including Ollie's wife, Black Canary. The pair left in a huff within a power ring construct. In Opal City, former Starman Mikaal Tomas mourned the death of his lover as an extension of the outbreak of super-villain violence. In Africa, the former Congo Bill mourned the massacre of his gorilla tribe and the murder of the hero Freedom Beast. The great golden Congorilla demanded justice. Taking the name rather literally, “Cry For Justice: The Beginning” was by James Robinson and Mauro Cascioli. Given the anger directed at this book, I was expecting it to be more provocative. Aside from being repetitive and starring a bunch of characters I don’t much care for in a slow building story, I found the issue pretty solid. The art is attractive, the premise is sound, and I think the characterization is dead on. It was also nice to see Ray and Ryan team up, however briefly.